Your course teacher will inform you whether you can take the course exam using the Exam application. Be sure to sign up for the exam in good time, as available exam times may be few and far between, particularly towards the end of the semester. The Examstudio’s opening hours depend on the library’s opening hours. If your exam is during the library’s self-service hours please be sure before the exam that your library card is valid! Cancel your reservation if you cannot take the exam at the reserved time! This will free up the exam time for another student. You can only sign up once at a time for a given course exam. You cannot sign up for the same exam again until you have received your results from the previous exam. Go to the menu and click the Exams button. Enter either the course code, the name of the course or the name of the course examiner in the search field. Based on your search, the application will display a list of the exams that you can sign up for. If you wish to see the details of an exam, click on the exam title. By clicking Register for the exam you will sign up for it. Next, you need to reserve an exam time. First select the exam room (Examstudio Raja) and the application will display all the available exam times. Select Height adjustable if you need an accessible workstation. Next, click on a suitable exam time in the calendar. Confirm the time you selected by clicking the Confirm exam time button. After this the Exam application’s dashboard will display the details of the exam that you have signed up for, including the computer that the Exam application has randomly assigned for you (such as COMPUTER-05). This is the computer that you will use to take the exam. Please note that course exams and maturity tests may be displayed on your dashboard in the Exam application even before you have signed up for them. In this case you do not need to use the search function; you can sign up for the exam by simply clicking on the title of the exam and choosing a suitable exam time. You will also receive an automated e-mail confirming your reserved exam time. Once you have finished, log out of the Exam application. If you are coming to take an exam at the Examstudio but do not regularly attend studies on the JAMK main campus, we recommend that you reserve an exam time primarily during the library’s customer service hours in order to avoid potential problems related to accessing the library and your library card. You can change or cancel your reserved exam time on the dashboard of the Exam application. You are not allowed to bring any belongings, such as your mobile phone or snacks, with you into the Examstudio. There are storage lockers equipped with locks outside the Examstudio that you can use to store your things for the duration of the exam. Please, remember to put your phone on silent mode before putting it in a storage locker so that it will not disturb those working in the library. You can take the storage locker key with you into the Examstudio. If you are taking an exam during the library’s self-service hours, you will need a valid JAMK library card. Please, make sure before the exam that your library card works and that your borrowing rights have not been blocked, for example. If your library card does not work, you will not be able to access the library during self-service hours and take your exam. Leave your library card in the storage locker for the duration of the exam. JAMK staff conduct spot checks in order to verify the identity of examinees. Be prepared to prove your identity upon arriving or leaving the exam. Leave your proof of identity in the storage locker for the duration of the exam. Arrive in good time, taking into account the time required to store your belongings and to make other preparations. Exams always begin at 30 minutes past the hour. 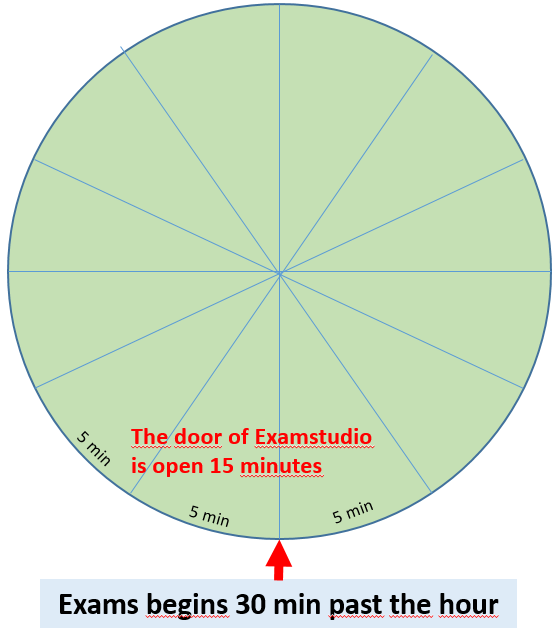 The lock of the Examstudio door opens five minutes before the start of the exam, and closes ten minutes after the start of the exam. 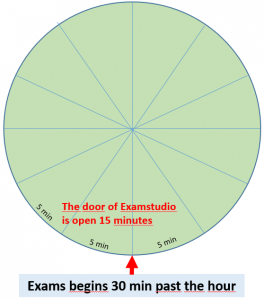 For example, if your exam starts at 9:30, you can enter the Examstudio between 9:25 and 9:40. If a previous examinee is still using your designated computer, give him/her a moment to finish up. Please note that the last five minutes of the exam time are reserved for finalising the exam and for leaving the Examstudio, as the next examinee may already be waiting for his/her turn at the same exam computer. Stay silent in the Examstudio! The exam period (one month, for example) is determined by your course teacher. You can reserve your exam time freely within the exam period. Once you have finished and your exam time has ended, be sure to clear up after yourself and leave the Examstudio without delay. You are not allowed to leave the Examstudio and return in the middle of an exam. You may leave once your exam is done. The exam time starts running at exactly the reserved time, even if you have not yet logged into the Exam, so be sure to arrive at your designated computer in good time. Once your exam time ends, you will be automatically logged out of the Exam, even if you did not complete the entire exam. Be sure to submit your exam answers even if you did not complete the entire exam. Otherwise you will not be registered as having taken the exam. Be sure to keep an eye on your remaining exam time, which is displayed on the screen, and reserve the last five minutes for finalising the exam and exiting the Examstudio, as the next examinee may already be waiting to use the same computer. Examstudio exams are taken using the computers in the Examstudio. Your designated exam computer can only be used to take the exam that you have signed up for. The exam computers are not connected to the Internet or networked. For security reasons, all your information and attachments are immediately deleted from the exam computer (not from the Exam application) once you log out. As such, please make sure that any attachments included in your exam answers are displayed correctly in the Exam application before you submit your answers. Turn on the exam computer and display. Log into the exam computer using the login details (not your user ID) displayed in the Examstudio. The exam computer will take approximately 20 seconds to log you in. After turning on the computer and logging in, wait a few seconds for the browser to open automatically. Log into the Exam application using your JAMK user ID. The exam will start automatically. If there is no exam starting half past hour, press keyboard F5 (display refresh). In the Examstudio, there is paper and pencils that examinees can use for taking notes and drafting. When you leave the Examstudio, place any paper you used in the locked waste paper bin. You are not allowed to take any paper with you out of the Examstudio. If you need access to some of your belongings or require special arrangements due to health reasons, please notify the teacher about this before the exam. We recommend sending an e-mail to your teacher about this right after signing up for an exam. Examstudio is monitored by a video surveillance system (also audio is recorded). The recordings are used to identify examinees and investigate suspected cases of cheating. If a student is suspected of cheating, the teacher may, at his/her own discretion, demand that the student re-takes his/her exam. Suspected and confirmed cases of cheating and unethical behaviour are handled in accordance with the Ethical principles for JAMK University of Applied Sciences. Empty your storage locker without delay so that it can be used by other examinees. You are only allowed to use the storage lockers for the duration of your exam. Once the teacher has assessed your exam answers, you will receive an e-mail notification and the results will be displayed on your dashboard in the Exam application.